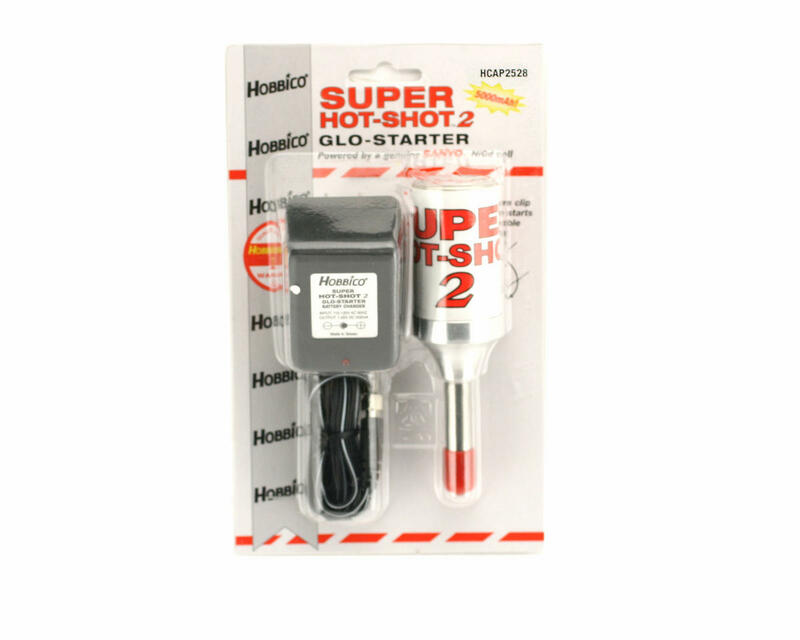 This is a Super Hot-Shot #2 Standard Glo-Starter with Battery Charger from Hobbico. 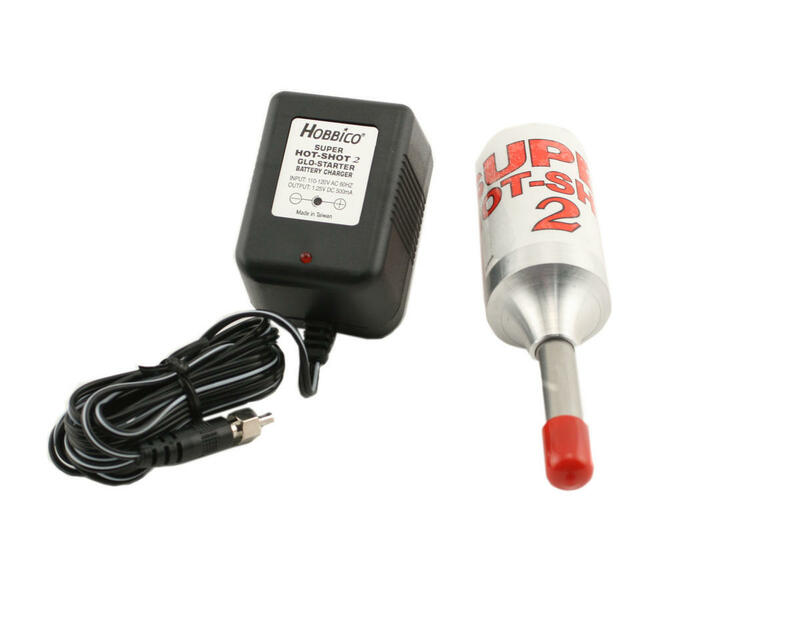 This is used to heat glow plugs to start glow-powered engines. Proven Twist and Lock Connector ensures a secure, solid connection that won't come off, providing safer, faster starts for your model. Pre-Installed Genuine Sanyo 5000mAh battery cell. Included AC battery charger with hex-shaped charge end recharges the glow starter in 10 hours. A red LED glows as unit is charging. Removable red rubber socket cap prevents shorting and any dirt or dust debris from entering into the the shaft. One Year Limited Warranty USA and Canada only. This is a really good and strong glow ignitor. It holds a charge for a really long time and heats plugs faster than most others that I have used! Outstanding glo-plug ignitor! Engine fires instantly every time, i really could go on all day how good it is. You wont find better, it is without a doubt the best igniter on the market and it seems to stay charged for a very very long time, if your in the market for a glow driver you cant go past the super hot shot 2. I cant recommend or praise it enough. I keep it charged but over the race weekend, i've used maybe 300mah total for charging. Great to know I should never have a car not start. Outstanding ignitor that lasts forever. Mine has been used to start 3 cars on a race day (plus random others that needed one in a hurry) and has never been drained below half way. Only issue I've ever had is with people walking away with it. It is fairly big so I'm grabbing the Hot Shot 2 for normal use and keeping the Super for backup. lasts for weeks on 1 charge and always glows like a cigarette lighter. @Brian Drake, it does lock onto turbo plugs, just not OS turbo plugs, it locks on the Novarossi plugs. Lasts forever. I don't have to charge it for a month. Best ignitor out there. This glow starter is the best investment I've made. Gone are the days that I'm bumping for ages only to realize my glow starter is dead. This and the long shot 2 are probably some of the best ignitors out there. I've had and use these ignitors for my nitro cars and nitro airplanes and has never failed me yet. Simply a great product. Simply the one of the best Glow Ignitors on the market, strong and last forever between charges. this is the best, period.. forget about the rest,will go for months without a charge and glows like a torch. The best ignitor period ! Only wish it came with a chain and a padlock so grubby fingers wouldn't steal them. Great ignitor, seems like everyone wants one though. I have had 3 stolen at big races. Best glow ignitor period! Only problem is, it has legs if left alone at the track. Last glow ignitor you will buy. It fits on my turbo plugs. It does take a long time to charge, but that is the price you pay for a 5000 mah battery. The only way it could be better is if it had a meter on it so you knew if the plug was bad. I give it a 5 out of 5 because it does exactly what it says, but the meter would be a great improvement. Pretty sweet that its a 5000mah battery and that should last along time. The only thing is that it wont lock on as it says with turbo plugs just standard. Doesnt matter much since I dont drive with it in the cool head but its worth mentioning. In the end its worth the money and the biggest battery I know of so far.